Not all Amish vaccinate their children, with concerns over safety, money and thwarting God’s will. Amish apparently also vaccinate their horses at a lower rate. Human vaccination has been a hot issue for many years. We don’t really think as much about animal vaccinations. However animal-borne diseases are a potential danger, and not just to a farmer’s bottom line. Officials in New York are trying to get horse-owners, and in particular Amish in the state to immunize their beasts against an equine brain virus. This is apparently a public safety danger as the virus can move from horses to humans via mosquito. There is no vaccine for humans available. In fact a young girl in upstate New York died last year of the disease. Since money is an issue, it looks like a state grant is going to help cover the cost. But will all Amish comply? Yesterday it turns out the first vaccination clinic was held at the “Herschberger farm” in the Heuvelton, NY Amish settlement. It’s a little unnerving to read that “no vaccine is available” for this or that scary disease. We’re getting to the point where it seems there is a pill or shot for just about everything, and what were once death-sentence illnesses are now curable or manageable or preventable. However science doesn’t have a solution for everything, and probably never will, even though what has been achieved is nothing short of amazing. I’d imagine a horse vaccine is available and a human one isn’t because, after all, the virus primarily strikes that animal. In any case this is another little reminder that life is, and always will be, only partially safety-proofed. I don’t vaccinate my animals unless they are traveling into a population that is a vector for disease. But we have been living in isolated areas for a long time, too. That is essentially my approach as well and for the same reason. My vet actually suggested that I NOT vaccinate for certain diseases that are not common in our area or must be transmitted by direct contact from horse to horse as there have been no horses within a mile or more of our place for the last 10 years or more and I never take my horses to places where they come in contact with other horses. Alas, that is all changing as there are now horses directly opposite ours on the other side of the street to our north and just down the street to our south. Therefore I may have to revisit this issue. With the (blessed) rain this year we have mosquitos for the first time in years and the threat of West Nile virus, so we are vaccinating for that and for botulism because we feed hay in round bales & of course tetanus because that is so endemic in horses. Otherwise, I pass unless there is a clear reason to vaccinate. I suspect the Amish can’t entirely use my logic because their horses ARE out and about with others of their kind. The reluctance to vaccinate, animals or children, is certainly not limited to the Amish. There are large numbers of people who do not vaccinate due to misinformation and superstition. The last person I argued with about vaccinating who told me that, if her child died, it would be “an act of God” was a white middle-class Catholic. The horses should also be WORMED! 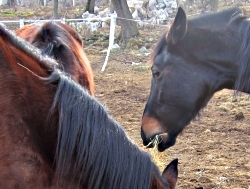 Many Amish and Mennonite horses are never wormed or at least not regularly and this should be a priority. Horses who are plagued with parasites are sick and debilitated and suffer when overworked in the fields. I can’t understand why any bible believing individual (allowed to think for themselves) would consider “God’s will” a tearing down or negative aspect of life. The bible teaches the Lord is a builder UP, the light, all things good. (exact words; “All that is good”) Storms, disease, and negative thoughts are all from Satan. Since everything we are able to do is by God’s grace, a doctor, or surgeons hands and knowledge is given by grace. Therefore, the knowledge and ability to stop disease should be considered “God’s will” as well. The other biblical reason to take care of ones body is all the verses relating to taking care of “your temple”, meaning we are commanded by God to take care of our body and be a good steward of our possessions. One reason for this confusion (according to the bible) is the verse “There will be divisions among you”, a trick of Satan to keep Christians divided, arguing and from prospering. Perhaps if we were all reading the same bible, we would all be on the same page? People have a tendency to pick out individual verses of the Bible to support what they already believe. Vaccinations have saved many lives. But vaccinations have also taken lives and caused mild to severe injuries. The federal government has a website to report adverse vaccine reactions. The Vaccine Adverse Event Reporting System (VAERS) can be found at wwwvaers.hhs.gov/ The federal government has set up a program to compensate people injured by vaccines: The National Vaccine Injury Compensation Program (VICP) website is at www.hrsa.gov/vaccinecompensation/ Infants have died as a result of routine childhood vaccinations. Millions of people have benefitted from vaccinations, but there are those who have died or been injured. No vaccination, no matter how minor or routine, is without risks. The same thing can be said for many, many medications. The risk of severe allergic reaction and death is present with anesthetic gases, antibiotics, “chemotherapy,” even aspirin, ibuprofen, and Tylenol, in rare cases. I guess it’s because the government mandates vaccinations that it becomes controversial. there are many low cost vaccinations available to farm here and in third world communities. Sounds like the same folks who don’t accinate their children also don’t vaccinate their horses. At least that’s consistent; I’d be appaled if someone vaccinated his horse but not his kids. Understanding those who choose to forsake vaccinations and put themselves, their children and their communities at risk is a feat I have yet to accomplish.